The Lucas Museum of Narrative Arts project includes demolition of existing surface parking lots and development of a new approximately 300,000 square-foot museum building that would include five-levels above grade rising to a maximum height of 115 feet. 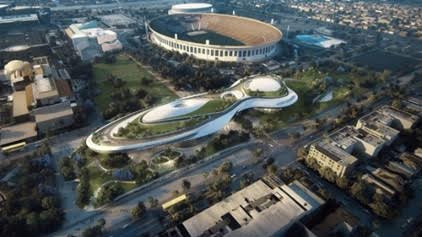 The project would include the construction of a two-level parking structure, located beneath the museum, and a separate three-level subterranean parking structure, to the south of the museum that will include replacement of the parking currently on the site. Up to 2,425 parking spaces would be provided to serve the museum and to replace the existing surface parking.